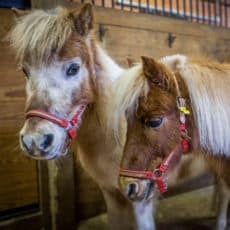 For the fourth year in a row, Green Chimneys has received a grant from the Petco Foundation’s Helping Heroes in-store fundraising campaign in partnership with Merrick Pet Care. This year’s grant of $2,500 recognizes the value of Green Chimneys’ engaging Dog Interaction Program and enables us to keep it strong. Piloted in 2014, the Dog Interaction Program has become a popular – and permanent – addition to Green Chimneys’ animal-assisted therapy program. Under a professional trainer’s supervision, our students help socialize shelter dogs, thus, improving their chances for adoption. During their 6-week training session, the canine “students” live on campus 24/7 and have frequent contact with our children and staff. You can see them visiting classrooms, participating in therapy sessions, enjoying time with teens at our Arbor House shelter and even “starring” in off-campus events including community health & wellness fairs. Prior funding from the Petco Foundation has supported Green Chimneys Dog Interaction Program and has contributed to its significant growth. To date, we’ve had 149 canine “graduates” and nearly all of them have found permanent loving homes. We are so grateful to the Petco Foundation for their support of this innovative program.